It was the beautiful colliding of two worlds, music and wine, that created our first Dinner & Concert of the year at Old Quail Run Farm. To host Lee Roy Parnell and the top winemakers from Lodi California in my back yard was surreal. The evening was made complete by the fine folk that make up our OQRF community. What idea just won’t let you rest: a mission, dream, or pursuit that both excites and scares you? Empower yourself to say YES with Kelly Welk’s words of inspiration at the next Gather & Grow Workshop at Old Quail Run Farm. Sunday Dinner. 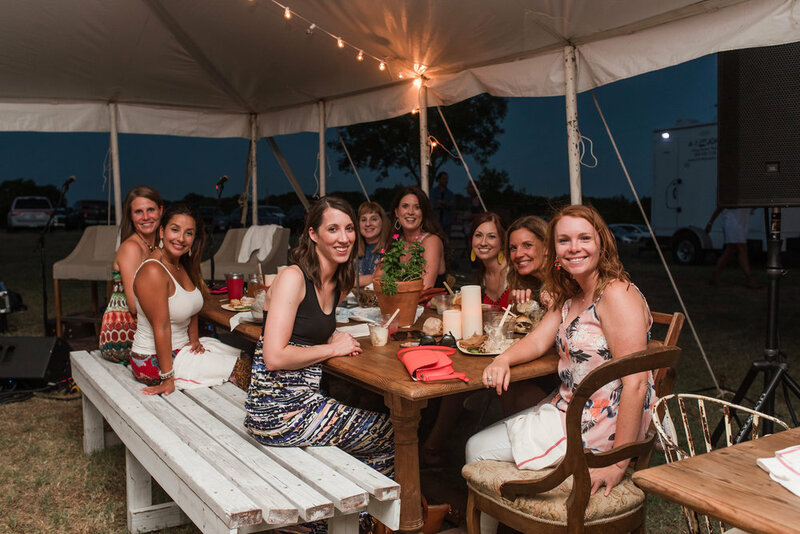 A Farm To Table Event at Old Quail Run Farm. Did your family have Sunday dinners growing up? It’s an old fashioned tradition that our family has protected and held onto. We gather at Mom’s house, each household contributing a portion of the meal. We laugh, we fellowship, get into a little trouble (shooting contest, anyone?) and problem solve whatever needs worked out in each other’s lives. Coincidentally, it just so happens that our best ideas magically appear over full bellies, coffee and Meme’s famous dessert. Go figure! 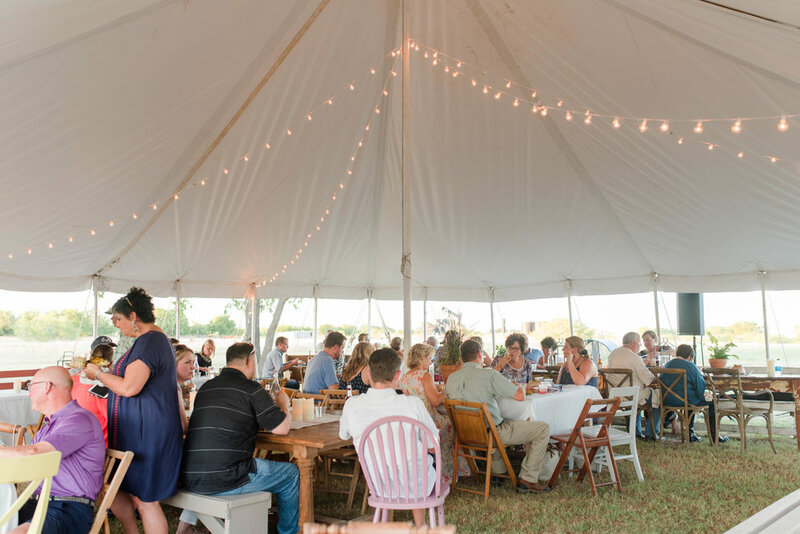 Last weekend’s Farm To Table Dinner at Old Quail Run Farm was on a Sunday. Inspired by my own family’s Sunday suppers and the simple blue and white country charm of new service ware, I decided to serve a version of our family’s Sunday dinner, filled with satisfying comfort food. The warmth of family and the soul penetrating hug of southern comfort go hand in hand for the Taylor-Dishners. Loaded macaroni and cheese, Meme’s mashed potatoes, garlic and rosemary beef, asparagus, savory squash soup and individual fruit cobblers filled our barn with the smells and tastes that only a family dinner can provide. 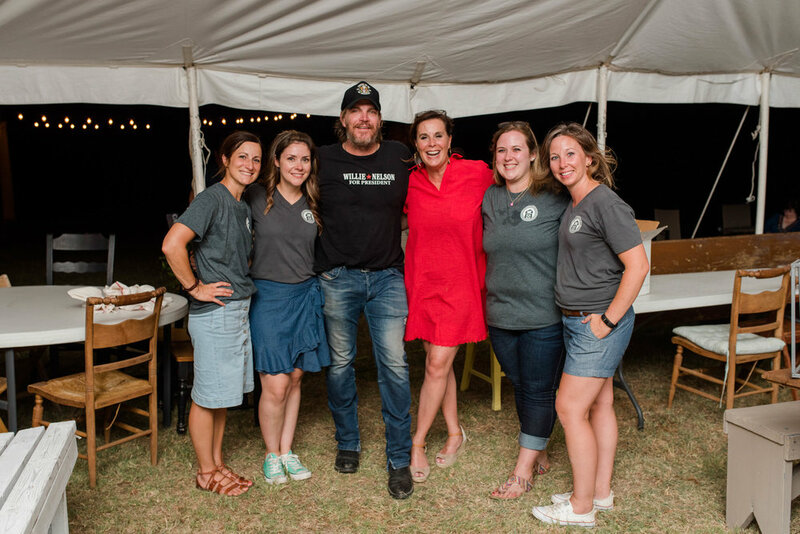 Almost every morsel that graced our tables was provided by our local family of farmers, a community of growers and ranchers who are fighting the good fight to provide the very best food for all of us in North Texas. What an honor to support them and showcase their labor of love on our table. A few weeks ago, I wrote about 25 Things We Learned After 25 Years of Marriage. If you haven’t read it, you can HERE. If I can add a number 26 (and I can! ), it would be to surround yourself with family and friends on a regular basis. Even if it’s not on a Sunday, family dinners work wonders on the soul and put a positive spin on our outlook for the whole week. I challenge you to plan one today! 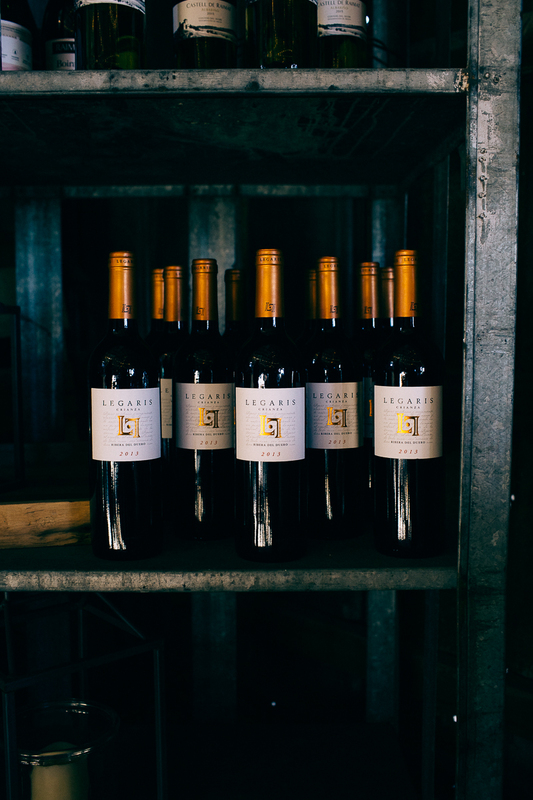 *Our next Farm to Table event is a pop up dinner at Square Cloud Winery in Gunter, TX. Find out more information HERE. Want to support our local farmers, but new to farm to table cooking? 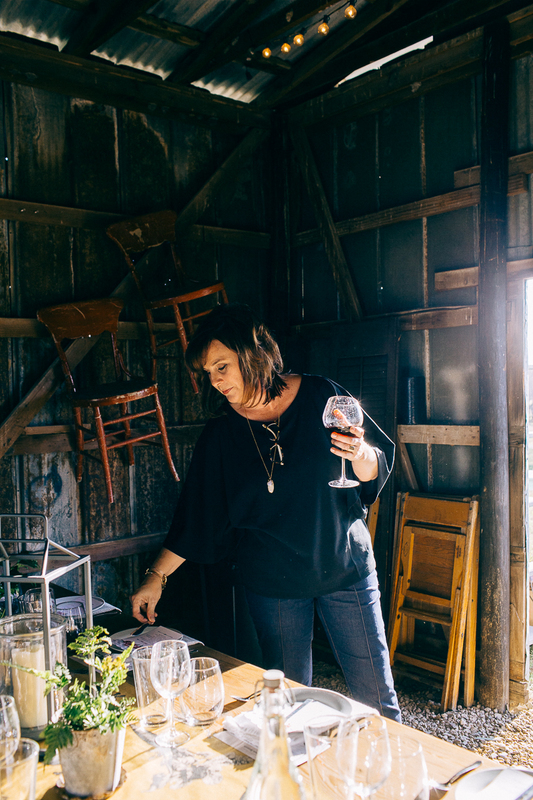 I’m offering a Fundamentals of Farm To Table Cooking class during Vintage Barn Sale. You can register HERE and learn more about Vintage Barn Sale HERE. We can’t wait to see you on the farm friends! 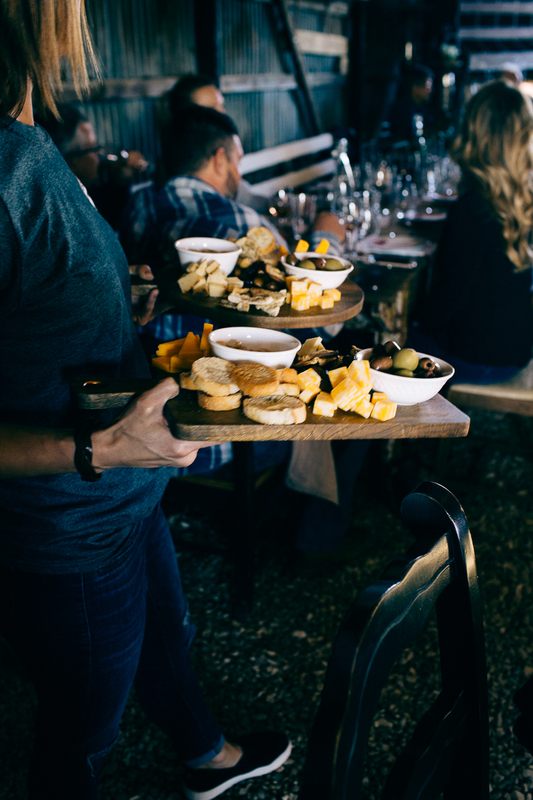 Interested in hosting a private party or farm to table dinner in our barn? Contact me HERE. This summer, Ricky and I celebrated 25 years of marriage with a beautiful vow renewal ceremony at the farm. It was humbling to pledge our lives again to each other, knowing now what those vows truly mean. The words no longer abstract, but made tangible by 25 years of “for better or worse” moments. Blessed to be surrounded by family and friends, this was actually our first wedding ceremony on the farm! We celebrated with food, drinks, and dancing…because these moments should be celebrated with gusto and merriment! Rick and I wanted to share 25 lessons or tidbits we have learned in 25 years of marriage. Some may have come naturally to us and some we’ve come upon the hard way. Such is the way of life and there is no one else I would rather do life with than this man! Keep scrolling to the end to see images from this fabulous and heartfelt day! I found so much joy in making this bouquet using both store-bought flowers and greenery around our home. We didn’t know what it meant to promise to love in sickness and in health, better or worse, richer or poorer…we do now. Truth is the most important element. Unloading the dishwasher or asking how you can help is way more appreciated than flowers! However, flowers & unexpected gifts are much better on any day of the year EXCEPT birthdays, Valentine’s Days and anniversaries. Not to say out loud everything you are thinking. Wait…hold…be still…Is is still true? Intimacy is very important. There are seasons of change, health issues, babies, but always come back together, and always think of the other’s happiness before your own. 8. Be adventurous! Choose to get out and explore together. Drive to new places, find new things, eat, drink and have fun! 9. Listen to music together. Go to live concerts, turn up the radio, and sing along together. Turn it up loud while doing mundane chores. It makes the work lighter and more fun! 11. Pray out loud together EVERY. SINGLE. DAY. 12. Say I love you. EVERY. SINGLE. DAY. 13. Make out. And I mean like you were when you were dating. Had to grab some family photos! This one will be printed for our living room. It makes my heart so happy. 14. Ask questions about each other’s work. Encourage each other, listen and push each other to be better in all areas of life. 15. Don’t be too prideful to seek help if your marriage needs it. It’s worth it and you are not a failure if you need help! It takes a strong person to ask for help and the fruit of asking is plentiful. 16. Communicate on a regular basis about your goals for your family, finances, businesses and relationship so you’re always on the same page. 17. Support each other’s hobbies, even if you don’t understand them or have no interest in them yourself. 18. Get out of town and completely alone at least 2x a year, even if it means pitching a tent in your backyard or having grandma/grandpa keep the kids for a FULL weekend! 19. Commit to date nights, even if you put the kids to bed early and enjoy a special late night meal in your dining room. 20. On that date night, commit to not talk about your kids. 21. Focus on the things you are thankful for in your spouse instead of the negative. 22. Say Thank you! Acknowledge the things they do even if it’s trivial and small. It matters! 23. Never stop working on yourself; spiritually, mentally and emotionally. 24. Physical touch is important. Touch your spouse every day; a quick hand hold, hug or hand on the back mean so much. 25. And finally, the most important that gives meaning and validity to the previous 24. God first. Spouse next. And then children. Bo Phillips kept us in stitches and with our dancing shoes ON! Seriously, what a talented and FUNNY entertainer! Thanks, Bo! Some of you may not know this, but in another life, I was singer. Nashville bound, I found my way onto many stages before putting my 300% (yep...300% is not a typo) into catering and hospitality. To combine my two loves was a dream come true. 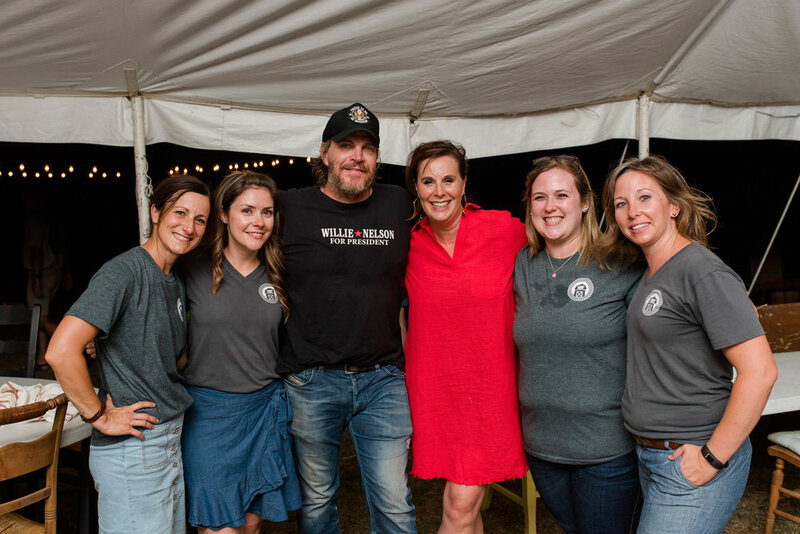 Hosting Jack Ingram and 100 of his fans on the farm was pure magic. We began with a private cocktail hour in the barn. Iron Root Whiskey and Lange Twins Winery provided cocktails and wine. 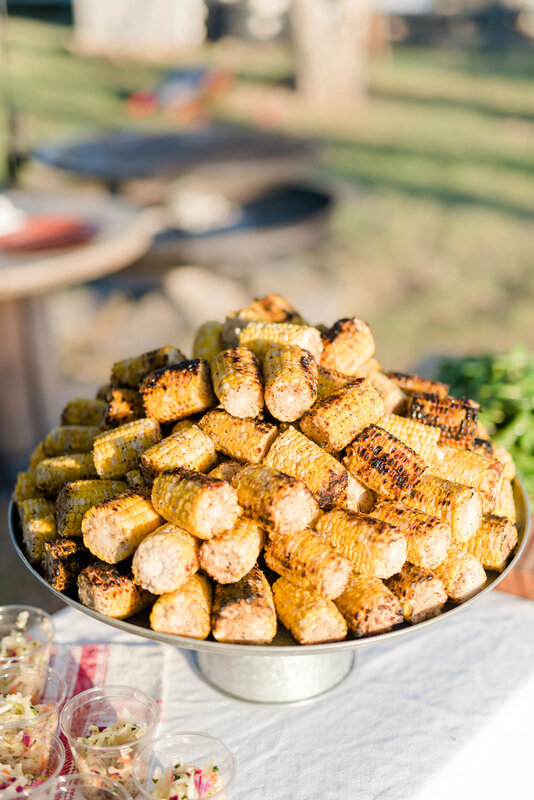 Then we moved to the backyard, under the tent, where we feasted on a meal that my grandmother would approve of: fresh beans, corn on the cob, bbq sandwiches, and banana pudding were some of my favorites offered that evening. And of course, Jack Ingram put on quite the show! Gracious, kind, and crazy talented, he lit up the farm with his personality, voice and talent. Thank you to everyone who came out to have some good ole fashioned country music fun with us! 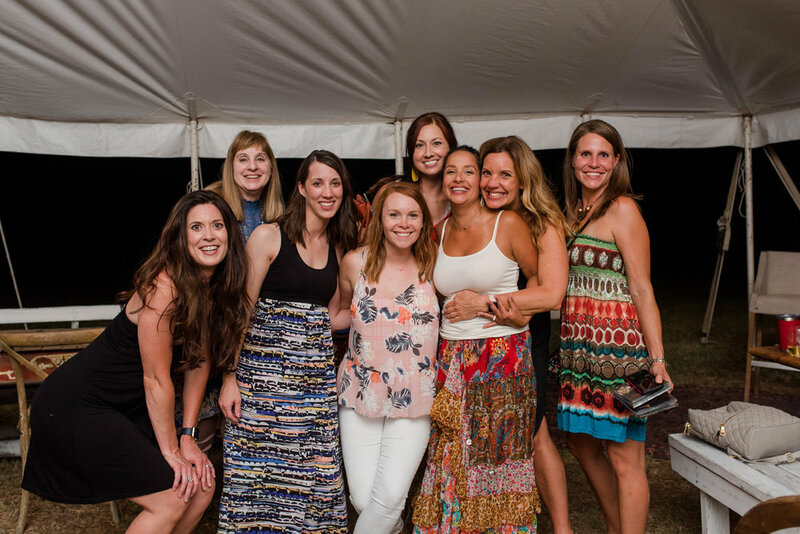 Make sure to stay connected and follow us on facebook and instagram for more events like these at Old Quail Run Farm. When I'm setting up for an event, I daydream a bit about what the builders of our 100 year old barn would think if they witnessed our wonderful dinners: dismay and certainly shock at eating in the barn, right? I am so thankful that they put time and energy into building well, and in the end, I do believe they would thoroughly enjoy the fellowship, laughter and good times that happen in our lovely and absolutely perfect little barn. Our first dinner of the spring was a side step from the past years strictly "farm to table" set up. The idea was hatched over a wine vendor lunch. Remember our October blog post "A Glass of Vino, Please"? You know the the one about our "working" lunch that involved rosé and lots of bacon? Yep, that's the one! We were introduced to a very special Spanish red that day that revved up our taste buds for Spanish tapas and had us daydreaming of a dinner experience in the barn; one filled with the lively buzz of good conversation and laughter, the sampling of wines produced from far away exotic lands, and the leisurely enjoyment of a decadent meal, all aspects of which recreate the famous Tapas tours of Madrid. Setting a beautiful table is the first "taste" of a dinner experience and the initial peek into the quality of the hospitality you are about to receive. It's so much more than decorating and we don't take the job lightly. Colorful menus rest atop each simple white plate and natural linen napkins wait for service. Finishing touches and bottles at the ready! Thick glass, European style bottles are filled with cold water and placed in the center of the tables to share. We throw seating charts out the window and guests arrive to pick their perfect seat. And so the evening begins with a simple cheese, Spanish olives, and spiced almond board. The most memorable experiences should have elements of both the familiar and the completely new in them, don't you think? The glow of the lights inside the barn makes for a magic atmosphere! Ending on a sweet note is the best and only way I can think to close out such a wonderful meal and evening. Maybe it's my southern roots, but we always have a tendency to over-emphasize that magical course called dessert. Why offer just one, when it's so much more fun to make (and eat) three? 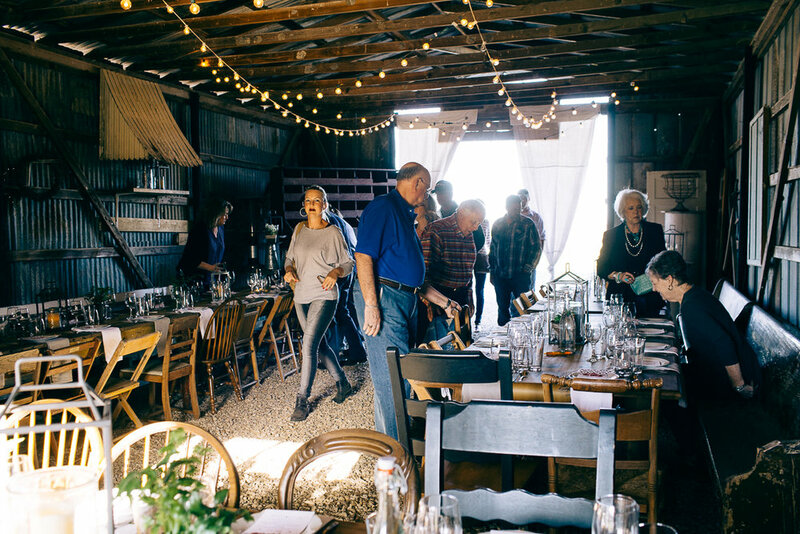 Experience a dinner event at Old Quail Run Farm. Join us for our spring Farm To Table Dinners on May 11th (PURCHASE TICKETS HERE) and May 12th (PURCHASE TICKETS HERE). We'll see you on the farm! Gather & Grow. A Day To Be Inspired at Old Quail Run Farm. Gather & Grow Inspirational Workshop was so much more than I could have ever dreamed, hoped for, or imagined, so that's how I know HE divinely orchestrated it, bringing together a barn (it's Texas ya'll) full of women ready to "gather and grow". We created. Got our hands dirty. Laughed. Ate. Pondered. Tasted yummy wines. All in the company of new and old friends, taking a Saturday to slow down and soak up wisdom and life. Many thanks to Jill McCormick, Nancy Davis of Ella Elaine Designs, Kathy Pryor, owner of the Vintage Mercantile, and my sweet momma, Kay Dishner for pouring your talents into our first Gather & Grow workshop. Many thanks to Lauren Hummert Photography for capturing these fabulous images for us!